Oak wilt may be spreading north in Wisconsin. Oak wilt was found near Three Lakes in 2010, but this is the first finding in the Minocqua Woodruff area. Officials cut down the diseased tree and several others and removed stumps in hopes of eradicating the pathogen. 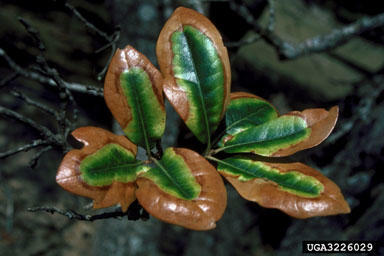 Schwingle says one sign of oak wilt is a tree rapidly dropping most of its green leaves. “Oak wilt is a pretty drastic disease. It causes an oak to go from one hundred percent healthy to dead in about two months. It’s largely spread to new areas through infected firewood. Schwingle says this is a big concern with the gun-deer season set to open. Oak wilt infects trees through open wounds on the bark in the spring and summer. The DNR says one way to protect your oak trees is to prune them over the winter…before they become vulnerable to the disease spores. The “buy where you burn” principle still applies in hunting season. The Wisconsin Department of Trade and Consumer Protection is reminding hunters not to haul firewood long distances when they head to their deer camps. Department spokesperson Donna Gilson says doing so could introduce new pests to an area. We usually think of an invasive species as taking over its environment, at the expense its native counterparts. But a new study from the University of Wisconsin Madison’s Center for Limnology challenges that assumption. It compiled survey data from a variety of studies on aquatic species, and finds that most of the time aquatic invasives keep a pretty low profile. WXPR’s Natalie Jablonski sat down with Gretchen Hansen, lead author on the study. A recently-formed group has set up an educational forum next week on how county forest land will be involved in a proposed mine project. Iron County has a portion of the proposed Penokee Hills mine. With little fanfare, the town board in Minocqua passed it's 2014 budget Thursday evening. WXPR's Ken Krall talked with Minocqua town chair Mark Hartzheim about the budget which will remain frozen for another year. Oneida county helped November 12 by restoring funding for the Minocqua police dispatch. The levy was set at $3.6 million dollars and the mill rate at $2.48 per thousand.